Regrets: We missed you: Mary Rose Dougherty (Senior Center). Thank you for checking in. At this moment future funding is uncertain and therefore CVNDC is reaching out to the Advisory Board, other organizations, CVMC, and the Health Department in order to see what options and opportunities might be available to sustain the Coalition. 1-The Health Department requested that we submit the proposal for the Tobacco grant for Washington County (up to $58,000) since prevention is needed in Washington County and no other entity here is applying. Ten grants will be awarded in VT. We have agreed to have it in on time on Friday, March 3rd. We did. 2-The Health Dept also just released the Request for Proposal for continuing the CPG strategies with a newly named grant called PEG (Prevention Expansion Grant) $40,000. Only 4-6 will be awarded in VT.
3-We are waiting to hear what portion of the reduced RPP funding may be offered to us as we want to continue to address the underage drinking and especially prescription drugs and opiate abuse prevention in central Vermont. New partnerships to explore: Support and Services at Home (SASH), VT Community Foundation, Lintelhac Foundation, A.D. Henderson Foundation, Blue Cross Blue Shield of Vermont, River Rock School, Health classes at the middle and high schools, Green Mountain United Way, the new Substance Awareness Club at Montpelier High School, look at schools’ Proficiency based requirements for health and how they fit with us. More ideas: Make a pitch to Capstone Community Action, National Life Insurance Co, Central VT Medical Center, or Blue Cross for a Planning Grant that would allow us some time to work on sustainability and whose mission would be enhanced by our mission. Look into applying for the DFC (Drug Free Community) grant next year in partnership with one of these organizations. All of this will help define our focus and role for the coming year starting July 1, 2017 and be in keeping with our commitment to provide the prevention piece to community partners such as Montpelier Police Department and Central VT Substance Abuse Services, and Project SafeCatch, to reduce youth drug use, reduce crime, and connect with vital support and treatment through Hub and Spoke. National DEA Prescription Drug Take Back Day is Sat, April 29 10-2. 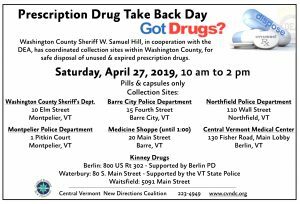 We are working closely with Sheriff Sam Hill to promote the confirmed collection sites in Washington County in order to continue to educate the public on safe disposal methods and get old medications out of peoples’ homes. We have brochures, posters, letter to the editor, article, and slips for pharmacies to distribute to their customers. We continue to work with all law enforcement agencies to install permanent drop boxes for year-round safe disposal for community members. Fri, June 16: Our youth advocate Jacob Bee Ho Brown Montpelier High graduation! Framing Prevention Messages Training for Community Education and Engagement in Prevention, Fireside Inn, Lebanon NH. 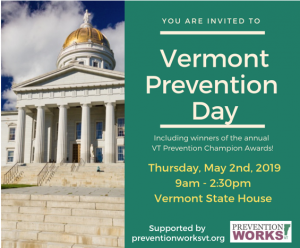 This training is designed for the Vermont Department of Health Regional Prevention Partnerships (RPP) grantees, and sub-grantees, VDH staff and community stakeholders. It is an interactive training to learn strategies to communicate prevention messages openly and honestly with diverse community audiences. Advisory Board Meeting Minutes – January 5, 2015 5:30 p.m.
Ginny reported on recent discussions at CVNDC regarding the rethinking about hiring a new person for the Youth Outreach/Tobacco Educator position formerly held by Marcus. Since we have current staff with more availability, expertise, and familiarity, we have decided to divide up tasks among Ann, Ginny, Deb Wolf, and Bill Merrylees for the time being and hold off on bringing in someone new. We will give this a try and see how it goes. Ginny shared the information we have received about the Vermont Tobacco Treatment Specialist Training in March 2015 for those interested in providing cessation services and especially as an onsite resource on a tobacco free college campus. We questioned whether or not this would be a useful tool for a coalition member to have in order to support our community in smoke free initiatives. Lisa was helpful in describing the current status of cessation workshops, participants, and trained specialists in this area and how the program works now with a starter package that has a 2-week supply of nicotine replacement. Lisa says there are very few specialists in the area, yet the current need is being met. In response to smoke free housing, it seems that more tenants are choosing to go smoke somewhere outside of the building as opposed to making an effort to quit with a cessation group. We reviewed the letter of application from Eva Bodin from Montpelier High School for youth board member/internship position and we were all in agreement that she sounds strong and passionate and we look forward to meeting her at the February meeting. In addition, we have heard that a senior at U-32’s Pilot program has been working on opiate treatment services and we would like to invite her to participate on our board as well. We shared the December 15, 2014 article published in the Times Argus as the first of our monthly “Current prEvents” contributions. We are close to completion on our January article on Marijuana. We will add info that articles will be archived at cvndc.org. Lisa reported that there are two WRAP leaders available to do a presentation at Norwich University when we need it. Advisory Board Meeting Minutes – December 1, 2014 5:30 p.m.
Ann will contact Montpelier Alive and Montpelier Business Association about smoking and share old downtown merchant survey information. November 3, 2014 Minutes were approved. Pat shared “Health in All” and how Dr. Harry Chen is promoting that all policies should support public health. We can include this philosophy and message in our Marijuana and other upcoming articles with the Times Argus. Central Vermont New Directions Coalition is presently working on our three main grants, PFS II, CCPG, and AOE Tobacco, and are connected to a number of other groups and organizations throughout the state to maintain a presence in the community both as a resource and as partners working in the field of Prevention. ADVISORY BOARD: After Spring meetings every other month, the Teen Game Night at the Mountaineers in July, the summer off, we met recently on November 3rd and decided to meet on the first Monday of each month. We usually have about 6 members attending meetings and the other members are kept updated via minutes and emails. STAFF CHANGES: Marcus Hass has left his position as Tobacco Educator/Communications on October 31, to relocate for personal and family reasons. Ginny will finish up at Community Connections this month and will continue her part time prevention work with CVNDC. Discussions are underway as to how to move forward, divide work, and possibly hire a young adult. PFS: (VT Dept of Health, Washington County Partnership for Success Grant II) CVNDC is the sub grantee (specifically covering Montpelier and U-32 towns) with the Washington County Youth Service Bureau as the Lead agency (focusing on Barre, Northfield, and the Valley) while always keeping the whole of Washington County in mind. -Reduce Prescription drug misuse among ages 12-25. -We submitted the required full report for Apr. 1-Sept. 30 on October 17, 2014. -We met to revise the budget for next year. -We have met with Select Boards of Middlesex, East Montpelier and Berlin and we are on the Agendas for Calais and Worcester this month. We are educating on policy approaches and providing information for towns to make decisions about restrictions on alcohol in public places and/or at community events, ie: ensuring a safe environment for youth and families at Fourth of July celebrations, in parks, and on beaches. We let them know where they have power, should they choose to use it. Our “Education for Cities and Towns” document has been a useful tool. -We support local Law Enforcement by providing DUI informational cards to hand out during their holiday Saturation patrols/traffic stops, and we promote the DEA Prescription Drug Take Back Days in April and September. During the checkpoint held during the Labor Day campaign, 864 vehicles were stopped and 111 tickets were issued, some DUI related, and one involving heroin possession. -Our ongoing relationship with VT Dept of Liquor Control helps community stores and servers. We promote the required training seminars that every employee and caterer needs to have completed before serving or selling alcohol or tobacco products. Recognition of stores and bars that have passed their stings and Compliance checks, by not selling to minors, have been done in the spring and we will do this again in early 2015. -As Norwich University cut a crucial position in Prevention, we are working with the Dean of Students and the Wellness coordinator to pilot the e-check-up to go, the confidential online education and assessment tool for students to look at their own drinking behavior and personal risk levels and how they compare to others. We are discussing this with U-32 and Montpelier High School as well. -With Prescription drugs an ongoing problem, we are connecting with pharmacists to provide education to customers on Rx drug misuse, safe storage, and proper disposal. We will work with prescribers as well. – We are currently having our CVNDC website redesigned by Tom Waters at Creative Waters who also did the Live More Drink Less VT site. This is paid for out of our PFS budget. The new site will be easier to update and will contain our Prescription Drug information and resources, modeled after work done in Windham county. We will promote this through a new Rx brochure, articles, and social media in conjunction with campaign materials supplied by the Health Department. -Vermont’s total from the National Prescription Drug Take Back Day held Saturday, September 27, 2014 was 3348.8 pounds with Washington County collecting 320.8 pounds. The Take Back total from April 26, 2014 was 3340.9 pounds. The drop box we supplied to Sheriff gets a lot of use each week. -Community mobilization continues as we are involved with Prevention Works VT, schools, parent groups, childhood trauma education work group, Health team at CVMC, and Montpelier Alive. -We attended the College Symposium on High Risk Drinking, held at Middlebury College this year, and gathered more information about various strategies being used to curb binge drinking and to suggest that their campus survey include questions about combining alcohol and prescription drugs. We will have a spring event to present info to parents and graduating seniors about alcohol and Rx risks. -We renewed our membership with Montpelier Alive and had a long meeting with new Director, Ashley Witzenberger, and shared our mission and resources and filled her in on plans for upcoming events. They will prove to be a great partner in getting smoke free area signs up for events, and we provided her with policy information and server requirements from the DLC in case some galleries wanted to serve wine during the Art Walk and Arts Fest. We will have a followup conversation about planning a Mocktail event to promote alcohol free entertainment. -We have been invited back to the Parents Group at Main Street Middle School and will present on Prevention at their meeting in January. CPG: (Combined Community Prevention Grant): Currently working on Tobacco, Alcohol, Marijuana, e-check up for Community members, Physical Activity, and Nutrition are Ann, Ginny, and Bill Merrylees. -Presently, we are conducting audits in stores in Washington county for statewide mapping purposes to show outlet density, proximity to schools of alcohol and tobacco outlets, advertising, promotions, and availability of healthy options at stores and whether or not they accept WIC and SNAP benefits. We are into our required 40 stores and have assigned another 55 to be done by Health department staff to be completed by end of December. -We provided information about Act 135, the VT law prohibiting smoking in a vehicle with kids, and no smoking around schools or in daycares, and 802 Quits information. Flyers were posted, info was sent to school newsletters, and an email blast was sent to all providers listed with the Specialized Childcare Resource Development Specialist at the Family Center of Washington County. -We are working with Tobacco Free College Campus Initiatives, and we recently presented information to the Human Services course students at Montpelier CCV to educate them about second hand smoke, third hand smoke, new Vermont laws as of July 1st, and cessation opportunities. CCV as a whole is not yet ready to commit, but the conversations are starting with some of the other sites. UVM has delayed their start date from Jan 2015 to Fall 2015 to be ready. -Marcus worked with Teen Leadership middle school students at U-32 for Red Ribbon Week, to promote healthy activities and not falling victim to tobacco advertising. -Ann attended the Smoke Free Housing Summit, held at Lyndon State College this year, and heard many agencies and landlords share their stories of going smoke free. We connected with Montpelier and Barre directors who need our services to provide literature and cessation information for their tenants. -We met with the Montpelier City Council in May and have requested to attend an upcoming meeting to continue discussions around smoke free parks in Montpelier. Since the vote just passed for a smoke free Church Street Marketplace, our hope is that this will nudge Montpelier to take action they have contemplated. – Marcus has presented to students and their parents of drivers education classes with Central Vermont Driving School in Moretown. These evenings are a mandatory part of the class curriculum and Marcus was there as a guest speaker to provide information on alcohol, DUI, second hand smoke in cars, drug impaired driving, Driving contracts with parents, and coalition missions. AOE: (Agency of Education Tobacco Grants) CVNDC has funding to provide Tobacco education at U-32 and Montpelier schools. At MHS, our objective is to increase awareness among students about the dangers of second hand smoke and of experimenting with any form of tobacco or nicotine delivery system. This rationale is based on the 2013 YRBS data that students reported a disconnect between the harm of cigarette use compared to other forms like cigars or cigarillos, and a disconnect between cigarette use and second hand smoke exposure . At U-32, we are working on increased communications to students and the WCSU community to raise awareness around the harms of all forms of tobacco, nicotine, and second hand smoke. According to the 2013 YRBS data, WCSU high school students reported below state average exposure to advertisements about the dangers of smoking within the past 30 days. Also, only 60% felt they agreed that teachers really cared about them and give them lots of encouragement. We look forward to setting up a meeting with editor and staff of The Chronicle to pitch ideas and topics to publish in the school newspaper. Advisory Board Meeting Minutes – November 3, 2014 5:30 p.m.
Ann to talk to Diadel Ortiz about what level is best for her regarding involvement with the board and to talk about contact with youth group at church. Mary Rose will draft a job description/announcement for 2 youth to join board for a limited term and to participate in coalition activities. Staff changes were discussed—Marcus has left his position as Tobacco Educator on October 31, to relocate for personal and family reasons. Ginny will finish up at Community Connections this month and continue to work with CVNDC. Ann, Ginny, and Deb will map out a plan for hours, responsibilities, potential new hire of young adult. May 12, 2014 Minutes were approved. Pat moves, Jim seconds. Ann’s contract for 2014-15 was discussed and approved by all. Pat moves, Mary Rose seconds, Jim signs. Revised brochure was reviewed and edits/comments recorded. Board discussion included keeping Marianne on the board with the understanding that she may be excused from Monday meetings due to scheduling conflicts. All expressed need to have some youth presence so Mary Rose agreed to draft a “recruitment” message. Times Argus “Current prEVENTS” articles to appear in 2014-15 and Great American Smokeout as an upcoming public presence that might “kick it off”. We decided to meet on the 1st Mondays of the month for now and hope this can work for most members. Advisory Board Meeting Minutes – May 12, 2014, 5:30 p.m. Someone (TBD) will email Megan Smith , information seeking, re: Jay Peak award. We decided to skip another meeting because we will have the July event and then summer off. Resume meetings in the fall when school is back in session. Next meeting TBA. Advisory Board Meeting Minutes – March 17, 2014, 5:30 p.m.
Ann and Marianne will talk to Ivy Zeller about “pre-teaching” the Hungry Heart film and how to provide enough framework and processing for high school kids. Pat will be present at a table of materials at The Hungry Heart evening showing at MHS on Feb. 4 while Ann is away at CADCA conference in DC. January 21, 2014 meeting minutes were approved. CPG (Community Prevention Grant) proposal submitted Feb. 28 We applied for the maximum amount of $155,000. MSMS Parents’ Group meeting has been postponed (twice) and will finally occur on March 20. Ivy will facilitate and show a short film about marijuana “Does Legal Mean Safe?” followed by a discussion. CVNDC will assist. U-32 Parent group meeting is scheduled for March 6. Ann has been invited to share a powerpoint of YRBS data followed by discussion with parents, Principal, and both Assistant Principals. CPG (Community Prevention Grant) opportunity is coming up and Ann will receive more information this week and next. CVNDC will work with Community Connections to submit a proposal, probably for the maximum amount of $155,000. Theresa offered to send info regarding the Community Health Needs Assessment that was conducted. We are working on the list provided by the DLC (VT Dept of Liquor Control) of the businesses in our area who have passed their alcohol and tobacco compliance tests. We will acknowledge these stores, restaurants, and bars with certificates, ads in the paper, and a visit with balloons. CVNDC has been invited to host the Smoke Free Housing Summit in May 2014 so efforts are underway to plan this event for 100 people. We discussed the history of having Teens on our advisory board and the general consensus that it would be helpful to make this happen again. We will reach out to SAPs at U-32 and MHS and the Ambassador group at MSMS and Marcus. Please Respond and let me know if Monday works for you! Advisory Board Meeting Minutes – January 21, 2014, 5:30 p.m.
Theresa Lever will forward the Community Health Needs Assessment data to Ann. Ann will meet with Marcus to discuss ways to get youth involved on our board. November 19, 2013 meeting minutes were approved. MSMS Parents’ Group meeting on February 13 will be a short film about marijuana “Does Legal Mean Safe?” followed by a discussion. CVNDC will assist. Ann reported that work has begun on the PFS (Partnership for Success) Grant and we will be funded $56,000 for our initiatives in the Montpelier and U-32 district areas by the Youth Service Bureau who is the lead agency. YRBS(Youth Risk Behavior Survey) data re: Prescription meds was shared briefly and we discussed having the Ambassadors group from MSMS present their data to CVNDC. We discussed including Diversion clients in our focus groups as community service.